Pleasant Living: Happy Fathers' Day! Father's have the very highest calling, for they are able to give their children a glimpse of the Heavenly Father's love. They are able to show, in human terms, what unconditional love and sacrifice looks like. I am often overwhelmed by the way that my dad has lived out his role as a father to his three daughters. We mean the world to him. I know that for sure. He would go to the ends of the earth and back for us, and he has. My dad is one of the most thoughtful people that I know. He is a scheduler, and that is likely where I inherited my need for a plan. He always knows what's going on with each one of us, and he is sure to follow up with the activities of our lives. He regularly sends texts or calls just to let us know that he loves us, and he's thinking about us. I can recall several unique occasions in which dad has gone to bat for me, and I can think of similar instances with my sisters. He's willing to stand up for our interests, in order to protect our feelings and our futures. Dad provided the very best life for us. He made personal and professional sacrifices to make sure that we received the best education that money could buy. He saw to our every need and wish and made sure that we were treated like princesses. We are his princesses, and we knew that. Dad protected our innocence and demanded our maturity. He nurtured us and fostered us into the brutal world of adulthood, so that we would be ready when the time came. Dad showed us the importance of family and vacations. He knew that time away as a family was an important part of making memories. He made sure we made lots of memories. My dad promoted my spiritual growth by making sure that I was always involved in church. When the time came, he led me and my sister to the Lord. When looking for a husband, I knew many of the qualities that I would be looking for were ones that I had learned from my dad. I needed a protector, a provider, a spiritual leader. These were the enduring traits that I'd grown accustomed to and required in my husband. In the last few years, I've seen my Dad bear my burdens. It's almost more than I can watch. I can see in his eyes that he would do anything in his power, if only he could take away the trials that I've endured. Dad, you have no idea the way that you've steered my life. I am the woman that I am because of you. Thank you for showing me the Lord. I love you. Happy Fathers' Day. Beautiful post. Isn't it wonderful to be blessed with an earthly father you really does have the characteristics of our heavenly Father? What an amazing tribute to a wonderful man! You are both blessed - father and daughter! I love you both! Lawrence and I were reflecting on your news this weekend while driving back from Dallas. As we were talking, I told him about the check that you received. We decided that it was a reflection of both of your parents and how they had raised you both. When you are raised by giving, encouraging, godly parents; you tend to be the same way, but in your own way, if that makes any sense. You and Brian are a reflection of the love and care that you both received. Not only from your parents but from the people around you. It is not hard to lavish gifts, even a baby stroller, on the ones that you truly love. It sounds to me, that you two are really easy to love because you love back so willingly. I do not know Brian's father, but your father is godly influence on more than his family. He has also touched our family. 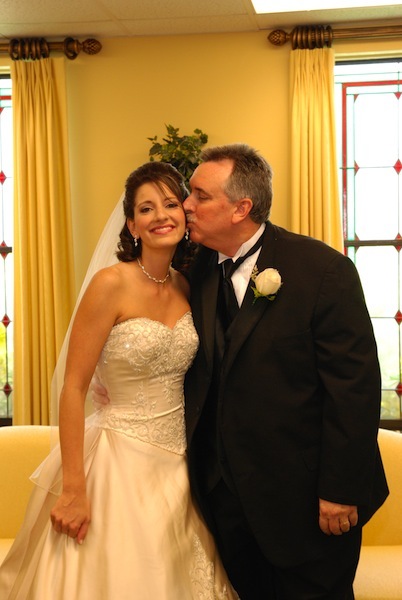 I did not grow up with a godly example but am so thankful that I married one. You, my friend, are truly blessed with health, happiness and family! Stormin the Throne on your behalf! What a blessing, Lindsey. I am always hopeful that my relationship with my dad will one day be like that.